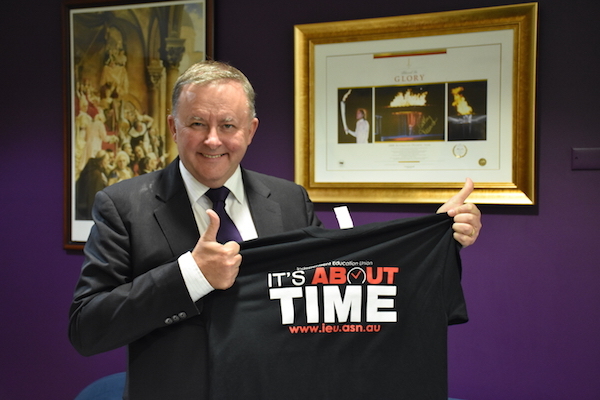 IEU branches from around the country have sent messages of solidarity to IEU NSW/ACT members as they take industrial action over a dispute with the Catholic Commission of Employment Relations, who are denying Catholic school teachers and support staff the right to arbitration. Messages of support were also received from Federal Member for Grayndler Anthony Albanese MP, Federal Member for Parramatta Julie Owens MP and Peter Primrose MLC. State Member for Campbelltown Greg Warren MP contacted IEU with the message: "I fully support this action and hope Campbelltown and the other IEU actions are a great success." State Member for Liverpool Paul Lynch MP letter of support can be viewed here. State Member for Newcastle Tim Crakanthorp MP letter of support can be viewed here. State Member for Granville Julia Finn MP letter of support can be viewed here. Parramatta Labor Councillor Patricia Prociv expressed her hope to be able to join the Parramatta stop work rally. Blue Mountains Unions & Community Public Officer Debra Smith letter of support can be viewed here. Social justice law firm, Maurice Blackburn Lawyers have put their support behind the campaign. ​​​​​The IEU Victoria Tasmania stands with our comrades in NSW. We commend your determination and strength in this protracted dispute. We deplore the stance that your Catholic employer representatives have taken again in bargaining, particularly their opposition to ensuring that you continue to have access, as is your right, to an independent umpire. Why are they so afraid of re-committing to a protection that you have always had? The right to arbitration is a final step in a disputes process, and a natural step. It does not increase disputation, it serves to resolve disputes. Stay strong, stay united, and you will win. Solidarity. What a surprise - Catholic employers prefer to deal with disputes in-house. Is this fair? is this just? Is this transparent? We don’t think so. The Fair Work Commission is the independent umpire established to transparently and objectively make decisions on matters in dispute. IEUA members in Western Australia urge the Catholic Commission for Employment Relations to listen to what so many of their employees and their union are saying - the right to seek arbitration is fair and reasonable. You don’t have any rights you can’t enforce. In the interests of objectivity and closure, all industrial matters that can’t be agreed by negotiation and conciliation must be able to be resolved by an independent umpire through arbitration. This cannot rely on the agreement of one of the protagonists. The SA Branch of the IEU supports and applauds your strong stand against the hubris and arrogance of the employers as they hold themselves out to be above the law ... to be judge, jury and executioner in matters in dispute. Stay strong ... your issue is important locally and nationally. IEU members are congratulated for their solidarity and resolve in the face of the Catholic employers' attack on fundamental worker rights. Our members in Queensland know from their 15 month campaign that Catholic employers do not listen until industrial action forces them to understand that they are wrong and need to change their position. All strength to the members as you defend worker rights. I have been following the news in the east and wanted to send you all a quick note in light of today’s action. I want to commend you all, as IEU members at Holy Family, for standing with thousands of your colleagues across NSW in walking off the job today. The decision to take industrial action is never an easy one and always one made when there are no other options. It is a decision made despite pressure from the employer and the community and with heavy consideration of a myriad of other factors, both personal and professional. However, I believe that when employers act in such a contemptuous nature and with such disregard for their workers, the real blood and bone of the Catholic Education system in this case, action must be taken. Access to arbitration is clearly important as if provides the opportunity for a third party to resolve major disputes. Removing this hard-fought protection takes away your access to fair and just processes and only provides more power to your employer. The bullying, intimidation and manipulative behaviour shown by the CEO in pressuring hard-working educators to accept a substandard Agreement, that only serves their interests, is abhorrent and must not be accepted. As union members, you are last line of defence in this fight and all unions should be paying close attention to this because, make no mistake, I guarantee that the bosses will be watching closely as well. If the CEO manages to strip your rights away, it will embolden the big end of town and employers across Australia to push a similar anti-worker agenda. In situations like this, we can only fight in the way we always have. Indeed, the only power working people have is when we work together and demand better. No change has ever come from inaction or without sacrifice. I hope that you all feel incredibly proud of your courageous action today despite every effort from the CEO to break you. Today you made the decision to sacrifice your pay in favour of the bigger picture, to fight and to push that line in the sand back. Your courage is a credit to Holy Family, your union and education and I stand with you in solidarity today. Stand together, fight together, win together.